A long-standing shopping tradition in the United States is really starting to catch on here in Edmonton. “Because we have so many stores here in West Edmonton Mall that are also American companies, they started bringing it over,” said West Edmonton Mall General Manager Danielle Woo. 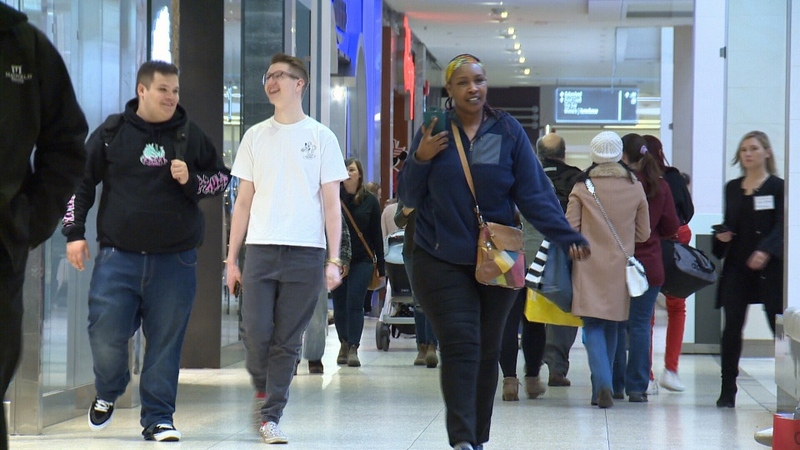 West Edmonton Mall, like many businesses in the city, extended its hours to give shoppers extra time to find deals. “I find that people now they’ll even take a day off just to have the Black Friday shopping experience. But because we’re open earlier and later, people come after work,” said Woo. She said Black Friday has become as popular as Boxing Day at WEM. However, crowds were a little less intense at other stand- alone retailers. This was Leon Niu’s first time taking part in Black Friday. He arrived at a Best Buy store around 4:30 a.m. to shop for his son. Some Best Buy shoppers were surprised there weren’t lineups to get in. “I know that it’s not like the States, like I knew it wasn’t going to be super crazy, but yeah definitely a lot less people than I thought there would be,” said one shopper. “I thought it was going to be way busier than it is but I guess that rush already passed, everyone’s at work now,” said another man. “Deals aren’t like they are in the States you know, it’s hit or miss. But you gotta go look,” he added. Still they said the deals were pretty decent. WEM is posting deals on its social media pages and urges customers to check its parking app before going to the mall. “Some people get used to parking in one spot all the time when they come to the mall so we’re letting people know those spots where there’s still going to be available to get a good parking spot close to the doors,” said Woo. Several retailers and shopping centres will continue the Black Friday deals into the weekend. Shoppers at West Edmonton Mall.